At this point, I am sure that enough time has passed since I last had thoughts from under my hat formulated and published in an Unlimited blog. With the first stint of my Unlimited placement done and dusted, I thought it only fair for my next blog to shed some light on one of the many experiences that I was a part of during those first two weeks. Unlimited’s Be There at the Start event, held at Attenborough Art Centre, will be my focus for this blog. My journey to the Be There at the Start event was far from instantaneous; as expected, the steps leading there all appear to me, in hindsight, to have been part of a much larger puzzle. The meetings with organisations such as British Council, the visits to museums and exhibitions like the DYSPLA International Moving Image Festival, and my inclusion in the Unlimited selection panel process all now appear to have in some way prepared me for the panel discussions which happened on the 23rd of March. The informal networking and artistic engagements that took place in Leicester all seemed to bring into focus, in a much more practical way, many of the ideas I had been exposed to. This, incidentally, was my first UK trip outside London and I was eager to soak up the atmosphere as much as possible. I was also looking forward to seeing first-hand what reactions were to the announcements of those who had been granted funding for their arts projects. This was an opportunity for me to see and hear what all the fuss was about for the day’s events. At this point, I knew that I would be one of the speakers on a discussion panel about artist’s working across cultures. This “Working across Cultures” panel also included Richard Butchins, Yetta Elkins (representing VIVA Carnival), and Rachel Gadsden. The less said about my nerves and my heart rate, which was beating like a messed up clock, the better! All of the speakers, apart from myself, gave accounts of projects they’d been part of from a British perspective of an insider looking out, whilst I provided the opposite of this – sharing my views as an outsider, from South Africa, looking in. This discussion delved into a cross section of countries and cultures ranging from Japan to Brazil and, of course, South Africa. The second panel, which was titled “Working across Sectors”, grappled with the idea of how artists collaborate with other fields. 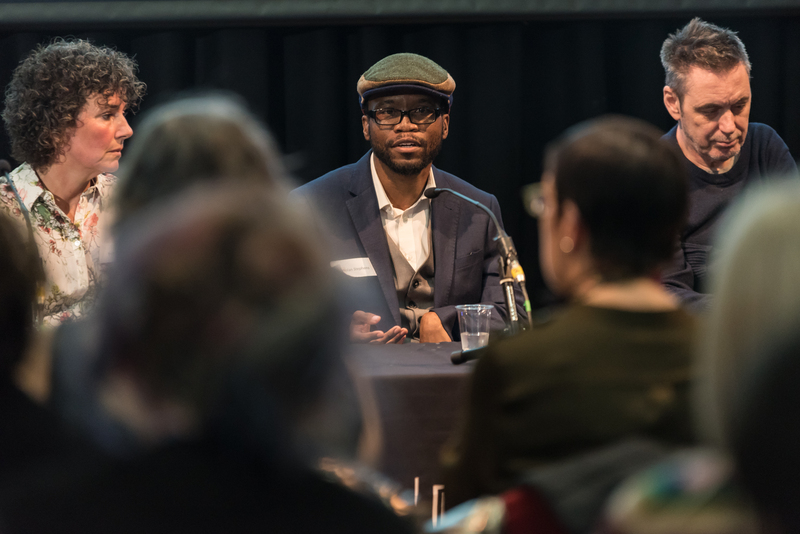 The panel included speakers Juliet Robson, Kai Syng Tan, Aby Watson and Omeima Mudawi-Rowlings, which highlighted cross-pollinations between fields such as art and science. The third and final panel of the day, “Where Is the Money”, addressed the gritty topic of finance and funding in the arts. Hearing the comments posed and questions tackled by this panel, which was made up of Saphia Bishop (Wellcome Trust), Helen Killingley (Spirit of 2012), Peter Knott (Arts Council England), Jon Opie (Jerwood Foundation), Moira Sinclair (Paul Hamlyn Foundation), and Shiri Shalmy, illustrated just how similar we all are in this art world. Even as far away from home as I was, the eternal battle of artists seeking funding raged on. These panel discussions were not the only attraction hosted by the Attenborough Arts Centre. After the panels everyone could take in the art works on show by Unlimited Commissions. Works by artists presented throughout the Centre by Richard Butchins, Anna Berry, Raquel Meseguer, Juliet Robson and Rinkoo Barpaga all demonstrated innovative means of communicating on not only the many intricacies of life lived by those with disabilities, but also showed off the incredibly unique ways in which artists see the world around them. This is something that I as an artist, writer and curator enjoy experiencing. This was particularly true of the informal gatherings after the panels themselves, where panellists, Unlimited-commissioned artists, as well as those in attendance could share ideas and continue conversations, making the old adage that “the conversations between strangers are the best” true. After much food for thought, the day’s incredibly packed schedule was drawn to a close with the staging of Jackie Hagan’s This Is Not a Safe Space. This genre-bending production was a fitting sign-off to a day that was sometimes sad, sometimes puzzling, but mostly an enlightening voyeuristic look into an art scene which was unknown to me. The names that were just names became fully formed and three- dimensional. The same can be said of the art works and the conversations I was part of. Here’s hoping that this building and understanding of the art scene I witnessed grows steadily when next I touch down in London for my next stint with Unlimited this September.